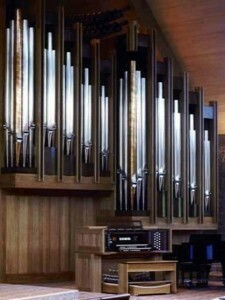 It has been a high honor to build the new organ for Our Savior’s Lutheran Church. The congregation is actively engaged in musical expression at every service and their participation is extraordinarily high. The new organ is a part of the congregation’s ongoing growth and recent construction of a new Church building. The Evangelical Lutheran Church of America is an inclusive, living tradition that embraces diversity and newness, while fostering liturgical expression through the Lutheran Book of Worship and its rich musical tradition. It is a catholic, inclusive tradition, and therefore, a balanced eclecticism must be embraced when designing an organ suited to fill a diversity of musical needs. The stereotypical north German baroque organ would not be adequate for this Lutheran congregation. Our instruments are liturgy-spirited, but literature-minded as well. They are first and foremost accompanying organs. Their primary roles are accompanying choirs, supporting hymn-singing and lending grandeur to ceremonial occasions. 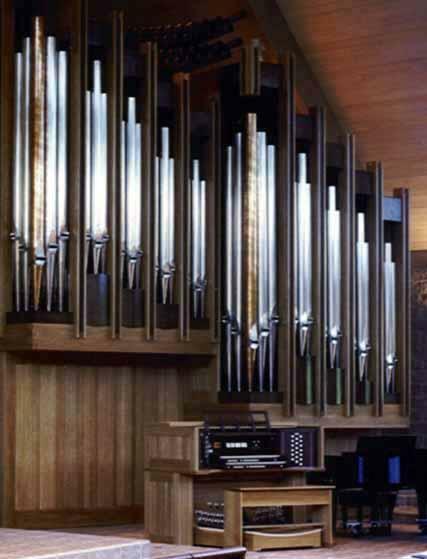 Providing the tonal resources to render a wide variety of solo literature for voluntaries and recitals is an essential requirement of an organ as well, and is given careful consideration when we design our instruments. An abundance of 8-foot stops creates a smoothly blended full sound, made more thrilling by each successively added stop as a crescendo is built. The rich, warm “Buzard Trademark” strings are able to support a congregation of 300 people (given the appropriate text being sung), and the full Swell behind the closed Swell box majestically supports a choir without overpowering. The Festival Trumpet (a Tuba) can regally herald the arrival of a bride or soar over the full organ’s accompaniment for a triumphant hymn stanza. The organ can text-paint the hymns and accompaniments through registrations and subtle changes as the meaning of the text shifts. Within its modest stoplist are the resources to colorfully play a broad spectrum of repertoire from the simplicity of an Ionian Psalm setting to the crystalline intricacies of Bach’s counterpoint. The case of this organ is made of solid white oak with walnut accents, and was designed in conjunction with the building’s architects. The facade pipes utilize flamed copper and polished tin, with the low 9 pipes of the Pedal 16′ Open Diapason made of poplar and cherry, lacquered in a color which harmonizes with the other colors in the room. The Tuba is horizontally mounted over the Great Organ and is made of flamed copper. The interior pipes are made of 50% tin and lead, with 15% tin for some of the metal flutes. Thanks to the Buzard staff who have made this organ a reality, and who turn hunks of wood and metal into living, breathing, and singing creations worthy to praise and extol our Creator!